I am trying to identify this pistol. I can't find anything with these markings. Thanks in advance for your help. It looks like the exact modern remake of a percussion cap black powder pistol that I owned for a good number of years. It doesn't look like anything special, and if it's the same model that I owned (sorry, sold it 3 years ago when moving, so I can't compare marks . . . but it did have a manufacturer's mark on the barrel) then it's a pretty cheap .45 caliber pistol. I can't remember, but I think it was like $150 - $200 retail? Designed to use modern percussion caps, yes? Cleaning/Packing rod has a threaded end for fitting modern cleaning brush heads and/or packing tips for non-ball ammunition (modern "mini-balls" or conical/pointed rounds)? Seeing this image makes me miss that pistol. It was a lot of fun to shoot. If it is the same kind of modern remake, it's nothing historical or of great value, but it is a great and reliable little pistol. It is a replica, of course. There should be proof marks on it somewhere. My guess is that it was made in either Spain or Italy. 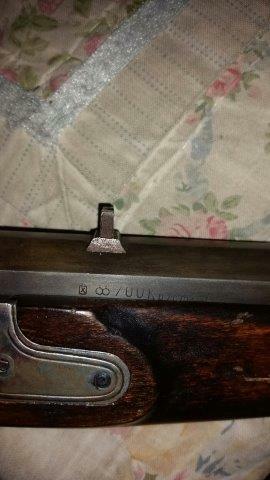 More markings may be on the underside of the barrel. 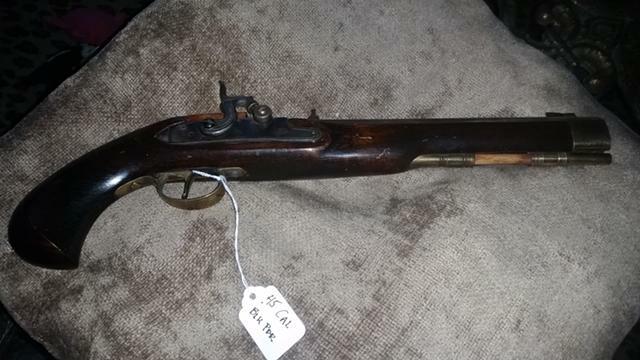 If it is not labeled on the barrel "Black Powder Only" then it is a fairly old gun by that I mean 35 years old or so. These guns are still readily available and there is minimal collector interest. Used, good shooters in good condition will bring $100 to $150. Thanks for the help. It looks older than it actually is. I am pretty sure it was made my Jakur out of Spain. I was looking to buy this one. Found one exactly like it (but never fired) that I already had bought years ago. Ben's comment triggered me to look closer to what I had. Glad the remark jogged your memory. Happy to be of help. If you've got one and haven't shot it, I'd recommend getting it out to a range, or somewhere you can shoot at, and give it a go. The pistol was a lot of fun to plink with when I owned it. Despite the wonderfully slow loading of a muzzleloader, I still think I put 200+ shots through the pistol I owned.